As the American Development Model enters its third season, it’s important to reflect on where we started so we can better understand where we are going. Many people are under the impression that the ADM is solely about cross-ice hockey for Mites because our staff’s efforts have been largely focused on this age level during the first two seasons. The Mite category, for all intents and purposes, is where most of our players enter the sport, and it represents our largest age group. Therefore, it made sense to start our kids off on the right path. The best way to do that is to establish the best possible playing environment, a higher volume of activity in practice and better utilization of resources (ice time) for our kids. size of the player but also encourages them to develop their individual hockey sense, which will help them down the road. Still, there are those who see the ADM at Mites from opposite ends of the spectrum. One group sees it as only for the recreational player, while another group views it as beneficial for future NHL players. 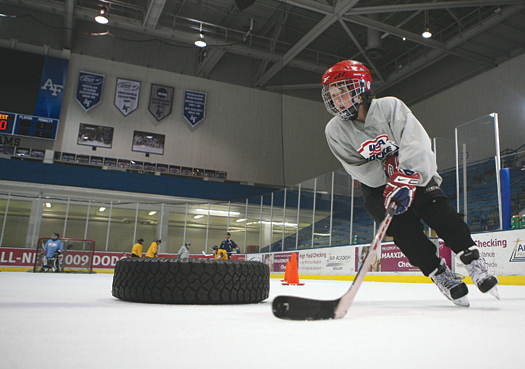 The American Development Model will focus more attention on 10 & Under hockey this season. Those who have looked ahead at our published materials can see that the ADM changes dramatically as kids grow. It begins to make clear distinctions between recreational players and those who strive to play at the highest levels. We also look at sports specialization and how players grow from Mites to Midgets to NHL players. from what is being preached in today’s youth hockey culture. Almost all of today’s pros were multi-sport athletes at a young age; in fact, many weren’t the best players on their youth teams. As we move forward we will continue to focus on getting our players off on the right foot, but we will also promote the ADM at older age groups. The 2010-11 season will see a shift to include the 10 & Under level. So what does the ADM at the Squirt level look like? Since this is the “golden age” of sports skills acquisition, we want people to focus on a better practice-to-game ratio. We also need to continue to focus on better quality of practices and have people realize the value in smaller roster sizes at this age. The average Squirt game usually consists of three 12-minute periods to fit within an hour ice slot. That means that with a roster of three lines and three sets of defensemen, players get roughly 12 minutes of playing time in a game. Kids at this age can easily play every other shift. A smaller roster allows for far more development time over the course of a season. same level of development while making better use of resources. Multiple teams on the ice allows for higher intensity with a better work-to-rest ratio. We also need to improve the quality of our practices. Coaching is hard work, but planning and executing a quality practice is not difficult. It takes time and a little effort to plan and think about what you want to accomplish. hockey sense while honing individual skills in actual decision-making situations. During the hockey game there are only four different situational roles in which players find themselves. They are either the puck carrier, an offensive support player, a defender at the puck or a defensive support player. Small area games provide the best platform to learn to play and compete in these specific situations. The biggest step forward this season will be through our updated Coaching Education Program. The change in delivery through classroom, on-ice and age specific on-line modules will allow coaches access to more information on player development than has been previously available. If you have not already done so, I encourage you to take a look at the ADM materials that outline player development for all of our youth players at ADMKids.com. While the hockey structure tends to look a bit different from one end of our country to the other, the physical and mental demands to be a hockey player are the same for all kids.